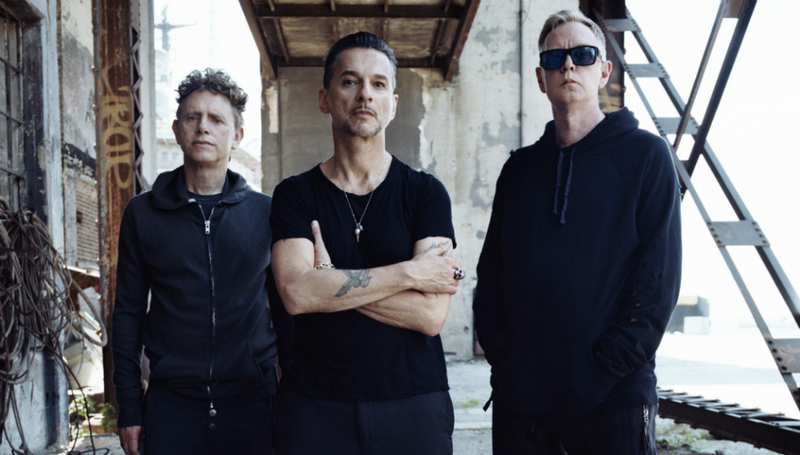 Throughout their 37-year career, Depeche Mode have always taken you on a trip to a New Life, into a Strangelove or straight to Heaven and the route they’ve chosen – bubblegum synth-pop, industrial krautrock or electro-gospel blues –has never been mundane. For their latest album, Spirit, the band have driven headfirst into a socio-political terrain many of their contemporaries would likely swerve. Heralding their return with the uncompromising single ‘Where’s The Revolution’ Depeche Mode sound at their most energised and pertinent in years. On the Tuesday afternoon at a central London hotel, Depeche Mode’s animated American manager says the guys are in “good spirits” (completely oblivious to the pun she’s just made) as she whisks me into a serenely white hotel room. Martin Gore is sitting by the window in the haze of a London spring day; he smiles as we shake hands with the same crooked boyish half-grin first glimpsed when the band made their Top Of The Pops’ debut, resplendent in Soho’s finest leather, back in 1981. He is, as promised, in a great mood with a warmth that makes you feel instantly welcome and at ease; he’s enthused about the band’s recent show for BBC 6 Music at the Glasgow Barrowlands (“just walking around we met people from all over the world who had come there to see us”) and eager to talk about the band’s new album. For his songs Gore has always delved into the contradictory nature of the human condition: love, hate, sexuality, jealously, inequality, compassion, addiction, redemption along with a good dollop of kink have all formed the basis of Depeche Mode’s most well-known tracks. In this way Spirit hasn’t marked a dramatic departure in Gore’s lyrical landscape, however Spirit has a political directness not seen by the band since the 1980s – a decade eerily similar to the peril and uncertainty we now find ourselves living in. Construction Time Again, the band’s third album released in 1983, made a career-defining break from the sugar coated pop roots planted by founding member Vince Clarke; the record drew on the poverty Gore had seen during a trip to Thailand as well as the common fears of the era; ‘Two Minute Warning’ heralded the threat of nuclear war and classic ‘Everything Counts’ chided the greed of capitalism with a radio-friendly chorus. At the time Gore refused critics labeling of the album as a political statement, telling the Melody Maker it was “common sense”. Like on Spirit the lyrics were never political in a politics with a capital ‘P’ sense, but more observations of an unjust world through Gore’s eyes. After the album, Gore touched on socio-political themes briefly on its predecessor Some Great Reward with ‘People Are People’ and then ‘New Dress’ from 1986’s Black Celebration, but no record released by the band until now took on social politics in the same way. The question of whether musicians should get involved in politics is always being asked, but even more so than when politics lurches violently to the right. Scouring through reviews before our interview the only “slightly negative review” of the album I find is from Pitchfork; the reviewer couldn’t fathom how a successful rich band could comment on those on the bottom rung of society, condescendingly saying about the track ‘Poor Man’: “Gore and [Dave] Gahan risk coming off as oblivious to the irony when they observe that 'Corporations get the breaks / Keeping almost everything they make'." Throughout the interview though Gore is keen to stress the album is not 49 minutes of the band preaching; the knowing irony of Dave Gahan, Andy Fletcher and Gore stood atop of a soap box in the ‘Where’s The Revolution’ video is not lost. When I ask him what he wants listeners to get out of the album he’s clear of his ambition. “I think with all of our music I want people to think when they listen to it. I don’t know if they’ll ever change their opinions maybe they won’t, but it can least make them think and if it can do that maybe there are a few people that much change their opinions”. Spirit is a landmark album for Depeche Mode for more reasons than its lyrical transgression; it’s the first album in 12 years not produced by Ben Hillier as the band opted instead to team up with a new producer, James Ford (one-half Simian Mobile Disco). Unlike Hillier’s clean production, Ford reintroduced the intense and varied textures reminiscent of the band’s seminal album Music For The Masses: ‘Going Backwards’ has a muscular throbbing beat to mirror the track’s message, ‘So Much Love’ has an unstoppable euphoric momentum, and the outro to ‘Cover Me’ transverses the cool air of Kraftwerk’s Autobahn. This month the band kicked off their Global Spirit tour in Stockholm, which will see them go on to play to an astounding 1.5 million fans in 32 cities in 21 countries across Europe alone including a date at the London Stadium on 3 June. During the interview, Gore is keen to get across that the band is here to do what they’ve always done best - perform. “We’re entertainers and we’ve happened to make this record and we’re talking about these points, but when it comes to the tour, we’re going out and hoping to entertain people for two hours”. Mad men aside, Gore is excited to get back on the road and with 14 albums in their back catalogue, the biggest challenge is picking the set list. On their last tour, the band came up with a cheeky fail-safe way to dodge picking what to play as Gore explains. “All of us threw songs into a hat and said, 'We might do these' and gave them to our programmer. It was just too much, he ended up combusting!” Gore says with a chuckle. “Luckily this time Dave took it upon himself to put a basic set together, which we just then slightly tinker with so we had a set quite early on.” It’s a set that like with everything else the band does puts the fans first. “We have to play some tracks from the new album and then keep people happy by playing stuff from throughout our career”. Spirit is out now via Mute. Depeche Mode play the London Stadium on 3rd June.